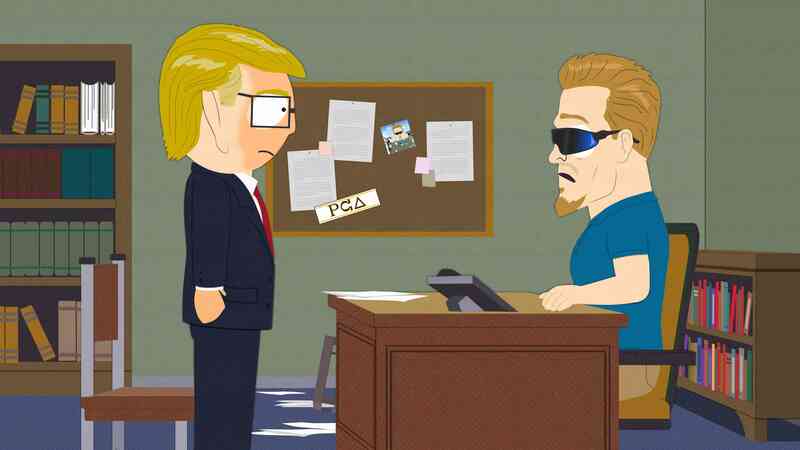 These past couple episodes of South Park have served as a major showcase for just how adaptable Trey Parker and Matt Stone can be. Last week, “Oh, Jeez” had to be reworked at the very last minute to reflect Donald Trump’s unexpected election victory. And as continuity-driven as this season has been from the start, that shake-up is still having ramifications. It’s clear that whatever plans Parker and Stone may have had back in October have changed significantly since then. But the fact that the Season 20 conflict is still so entertaining speaks highly of their ability to improvise. In some ways, the fact that Mr. Garrison won the election rather than Hillary Clinton actually seems to jive better with the show’s general direction this year. It certainly fits with the whole Member Berries concept and the idea that political developments like the Brexit vote and Trump’s election show humanity clinging to the past rather than trying to move forward. As this episode explores a world rapidly being consumed by fear and paranoia, the season begins to feel more timely and relevant than ever. The Member Berries are one area where you can see the show deviating from its original course. Early on it seemed as though Parker and Stone were setting up J.J. Abrams as the big villain of the season, with Abrams using his remixed National Anthem and formulaic Star Wars sequels to lull the public into a nostalgia-fueled sense of complacency. But now the Member Berries themselves look to be the true villains. Beneath their nonstop flurry of Star Wars references, the Member Berries are intent on reigniting the Cold War. Which, of course, seems well on its way towards returning in the real world. But that’s not even the true heart of the Member Berry threat. This week we also met the head Member Berry, a shriveled, Vito Corleone-esque figure who seems to treasure the ‘40s every bit as much as the rest of his kind adore the ‘80s. This berry would rather bring back World War II. It’s a little weird that all the frequent Star Wars humor this season seems to boil down to fodder for one specific twist – “‘Member the real Stormtroopers?” – but it fits. The idea that peaceful, idyllic Denmark seems poised to become the Germany in South Park’s World War II 2.0 speaks to just how wonderfully absurd this season has become. As much as this episode focused on delivering biting social commentary, Parker and Stone didn’t forget to simply be funny. For one thing, there was the hilarious opening sequence in which a victorious President-elect Garrison returned to South Park to gloat and force his enemies to… err… hydrate him. The Darth Vader homage was a nice touch, complete with the off-key rendition of “The Imperial March.” The Garrison/PC Principal reunion was especially great. It called back to Season 19 in a clever way, proving that the show’s newly continuity-driven approach can link entire seasons together as well as individual episodes. But that encounter also offered a pretty insightful reminder of how the backlash to political correctness helped fuel Trump’s rise to power. Gerald’s storyline also took an amusing turn this week as he manipulated Ike into taking the fall for him. That twist served as terrific payoff for the recurring motif of Gerald’s father/son chats with Ike. Watching poor Ike being forced to Photoshop nasty pictures and type all sorts of horrible things was easily the highlight as far as humor went this week. You have to wonder what Gerald’s ultimate comeuppance will be if he’s stooped this low. Sadly, the Cartman/Heidi storyline continues to lag behind everything else. The shift to SpaceX headquarters didn’t give this subplot quite the shot in the arm I was hoping for. Having Butters there certainly helped, as it put Cartman on the defensive and allowed him to revert a bit more to his traditional self. And it was certainly fun hearing Elon Musk voice himself during the guided tour. But in the end, this subplot still spent too much time rehashing the “women are funny” jokes and not really pushing Cartman’s dilemma along. That said, it is easy to see where the season is heading as far as Musk and SpaceX are concerned. The real, driving theme this year is that the world is dangling on a precipice, and clinging to the past rather than charging boldly into the future is only going to ensure humanity’s downfall. The Member Berries embody the danger of nostalgia-fueled complacency. SpaceX and the quest to reach Mars speaks to man’s better, nobler qualities. Musk, alongside Cartman, Butters and Heidi, may wind up being the heroes that save the planet from the Member Berries’ global war in these final two episodes. Hopefully the payoff will be enough to make up for the lackluster build-up where Cartman is concerned. South Park’s 20th season continues to be a wild ride as the final showdown looms. This episode cleverly built on recent political events as it shed more light on the Member Berries and their true, horrifying plan for mankind. At the same time, it also delivered plenty of laughs as Gerald betrayed Ike and Mr. Garrison lorded over his friends in South Park. It’s just a shame that the Cartman/Heidi storyline still isn’t measuring up to the rest of the show.